FPI's State of the Industry Survey indicates continued volume and profit growth, increased market expansion opportunities. 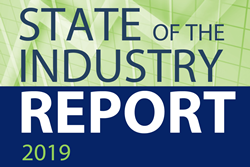 The Foodservice Packaging Institute’s 2019 State of the Industry Survey shows steady industry volume and profit growth will continue this year. Based on the feedback of nearly 90 organizations, the 2019 State of the Industry Survey predicts another positive year for the foodservice packaging industry, despite increasing environmental concerns. The Foodservice Packaging Institute’s 2019 State of the Industry Survey shows steady industry volume and profit growth will continue this year. The survey includes input from raw material and machinery suppliers, converters, and foodservice distributors and operators. The survey looks at industry issues, such as changes to volume and profits; expansion and purchasing plans; and opportunities and challenges facing the industry. One of the most notable results is the optimistic outlook for industry growth. Compared with 2018, over 75 percent of foodservice packaging manufacturers and suppliers expect volume expansion and more than 65 percent expect profit growth in 2019. On the topic of market expansions, respondents overwhelmingly view the fast casual sector as the greatest area for opportunity. This is due to the increased number of fast casual options, quality food offerings and value to their customers. Areas such as supermarket / grocery stores and delivery services are also noted as opportunities for market expansion because of the popularity of being able to grab products on-the-go or have them delivered. New this year, respondents also view convenience stores as an area of expansion as they try to compete with quick serve restaurants and become an eating destination. The positive indicators for growth in 2019 include over 60 percent of the North American manufacturers planning corporate expansion through construction of new facilities, expansion of current facilities, and mergers and acquisitions, and more than 75 percent of North American converters who plan to purchase machinery in 2019. 2. Lack of qualified labor. 3. Recovery / end-of-life options for foodservice packaging. 4. Increasing government legislation / regulation. “We are excited by the growth and positive outlook within our industry, despite some of the challenges we face. It’s encouraging to see the optimism within our industry,” said Dyer. FPI members and contributing participants received complete survey results. A complimentary executive summary of the report is available on FPI's website. FPI promotes the value and benefits of foodservice packaging and serves as the industry’s leading authority to educate and influence stakeholders.